Bagunça is Portuguese for a mess and considering the tropical climate in Rio a “hot mess” would more accurately describe the atmosphere of the Fernando Terere jiu jitsu academy. Not a hygienic mess like some people might think, but a loud, cluttered, rambunctious human mess. 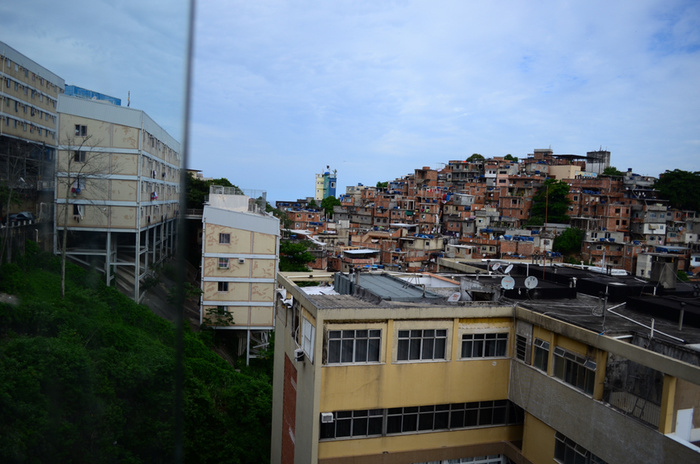 Kids running everywhere, soccer balls flying through the air, hip hop music so loud the concrete walls start thumping, teachers dancing and engaged in conversation, and Terere sipping tea off to the side somewhere while simultaneously running the project and joking around with visitors. Terere is known for his charismatic personality and his academy is known for its loud music and tumultuous atmosphere. 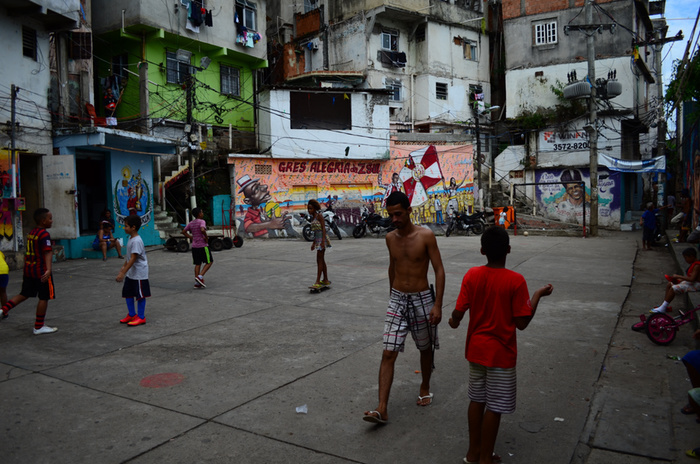 The kids descend from the Cantagalo favela two times a day to escape from the harsh realities of the socio-economic vice grip that marginalizes them from most other recreational activities throughout the city. Some kids, like Jhonatahan Marques, more commonly known as Moicano, spend a lot more than the allotted 3 hours a day on the mats training. Moicano is constantly looking for anyone willing to throw on a kimono and train with him, whether it’s a fellow teammate at the main FT academy where he used to have his own key or friend from one of the other social projects in the favela. The lights were on but it was dead silent. There was no sign of the academy’s characteristic Bagunça. At first glance, it seemed that the academy was closed, but after walking up the stairs it was apparent that the door was slightly cracked. Inside Moicano and his friend Caio Marques were drilling positions off into the corner—completely absorbed in their own world. Moicano was only 15, but he had showed attention to detail while reviewing positions than most black belts. Jiu jitsu was all he cared about. School was just an afterthought. Going out with friends? Well, all his friends trained jiu jitsu. And girls? Never that, he was in a “serious relationship with BJJ" and he even at his precocious age, he was faithful. There was not a person in Rio that could question the kid’s dedication to the sport. It was a week before the IBJJF Pan Kids in Long Beach, California, where, pending approval of his visa, Moicano would be traveling outside of the country for the first time to compete in the biggest competition of his career. Terere Kids Project had campaigned for months in order to fundraise the donations needed to pay for his passport and visa, but the application had been denied. With help from a friend, they were able to find more money for a last minute resubmission of the application in hopes that he would be able to fulfill his dream of competing in the United States. In the end, his focus paid off. His visa was approved, the paperwork allowing him to travel alone as a minor was signed off on at the very last minute. And after 3 tough fights, Moicano became the 2016 Pan kids champion. His brief stint in the U.S. playing paintball, long boarding down the beaches of Cali, and soaking in bubble baths for the first time didn’t seem to phase him in the least bit. He returned to Rio, just as humble and dedicated as he was before. There was, however, a noticeable change in the way he trained at the gym. Before he would always play his own game, throwing his legs behind his head and berimboling everyone in what could be the most frustrating of fashions. But after long hours of drilling and taking private lessons with black belts both at the FT academy and the Alliance gym headed by Alexandre Paiva in Leblon, Moicano’s training style began to mature. Instead of drawing less experienced students into his own style of inverted guard play, he let people try to beat him with their own game. He would study each person's style and then meticulously dismantle hooks, grips, and lassos the way he had been taught in his private lessons. Now almost a year later, Moicano is approaching 16-years-old, the age where he will finally graduate out of the juvenile grading system and received a blue belt. Come January, he’ll gain access to ALL the IBJJF competitions, including Worlds in California, where he can compete to become World Champion for the first time, a prestige coveted by all BJJ practitioners, but unobtainable for many Brazilians due to their inability to gain a Visa into the United States. But before he makes his way back to the U.S. for the second time, Moicano has his heart set on traveling to Portugal to compete in the IBJJF European’s alongside his teacher Fernando Terere. Thanks to private donations sent to Terere Kids Project, he already has the money for the registration and partial funds for a plane ticket! You can find out more about Moicano and his campaign to make it to Portugal on the Fund Moicano page of the TKP site.